Tag Heuer CEO Jean-Claude Biver described the Swiss watchmaker's debut smartwatch as "a marriage between Switzerland and America" at the launch event in New York earlier this week. If that's true then it was a marriage born out of a complex ménage à trois and a 15-month courtship. While Tag took care of the design and build of the traditional watch components, Intel took the lead in terms of hardware and Google, of course, was on hand to deliver the OS. "We had conversations with Tag and other brands that we thought might be interested even before we announced Android Wear," David Singleton, VP of Android engineering, told us. "It really kicked off in earnest about 15 months ago. That's when we got the teams together in Switzerland. "This whole project has just been a really great experience. That's really because every company involved – Tag Heuer, Intel and Google – have really brought their own strengths to the table, but have been willing to listen to what each of the others was thinking and wanted to do." The Tag Heuer Connected is the 11th Android Wear device to go on sale, but the first to pack Intel processing power. The silicon giant had big Android Wear ambitions from day one – but didn't feel the need to rush its first product to market. "What we want to do is be best," explained Jerry Bautista, VP and GM, New Devices Group at Intel. "Best as measured by performance, power, user experience, fashion and beauty. Sometimes people confuse first and best. First isn't usually best. "The chipset is very important because it allows us to very quickly, and with incredibly low latency, come to speed and come to action. People are frustrated with laggy response. They may not see it the first time they use it but, after six months, it becomes a problem." The obvious question mark that hangs over the Tag Heuer Connected is the price tag. Why would you pay $1,500 for an Android Wear smartwatch when you can get the exact same OS on a device for less than a tenth of the cost? David Singleton thinks it's the attention to detail and the fact that the Connected is a Tag watch first and foremost, and a smartwatch second. 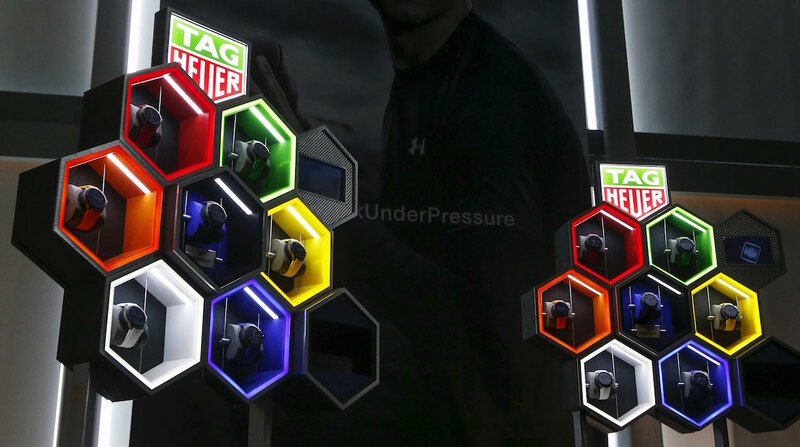 "We spent a lot of time really explaining to Tag Heuer how they could really take advantage of some of the stuff we'd already built into the operating system in order to express their own style and creativity," he told us. "It was really exciting and fun for us to listen to what Tag wanted and then to show them how it was possible in the system. They've done a really impressive job in bringing their heritage and styling into the watch faces." Without doubt, there was more focus on the watch faces of Tag's smartwatch at the launch event than for any other Android Wear rival. Tag has baked some neat smart widgets, such as the interactive counters, into its traditional designs but telling the time is very much front and centre of the Connected experience. "Tag was very clear about this," explained Bautista. "They said: 'we want a watch that really is a watch.'" Key to this was avoiding the dead-area flat tyre of the Moto 360 range. "It must be round," continued the Intel exec. "It cannot be anything other than a complete circular display with no black spots. "In early conversations, Tag would say, 'No, we want a full dial' and we'd say, 'If we just use the flat-tyre we don't have to worry about the ambient light sensor'. They were insistent on the design principles and actually made us do things we probably wouldn't have done. The result is that much better because of it." The focus on time-telling was extended to the display tech chosen for the final device. Rather than an OLED display ranking high on the ppi ladder, the decision was made to construct the screen using technology that would offer the best all-round visual performance. "OLED displays and other types of backlit displays have trouble in the sun," Bautista explained. "And they consume a lot of power too. The transflective display we used does both transmission and reflective. It uses the ambient light in a room and in sunlight it mostly reflects." So why Tag Heuer? Both Intel and Google revealed to us that they have talked to many fashion brands about the possibility of Android Wear devices – the Fossil will come next; the Q Founder is due to land before Christmas. But Tag was always going to be first. "We actually talked to other luxury brands before we talked to Tag," said Bautista. "But people consistently pointed to Tag. They were a very natural fit for us." "Tag is synonymous with technology and innovation," added Singleton. "It's been a really inspirational project."